Academic freedom, as with any freedom, is not absolute. Academic freedom ends when the exercise of that freedom infringes on the rights and freedoms of others in the community. Just as freedom of speech does not include the right to shout "Fire!" in a crowded movie theatre and freedom of assembly does not include to assemble on I-95 during rush hour, so also there are fair and reasonable limitations to the exercise of academic freedom. Insofar as academic freedom is extended to the use of college or university web servers, these same limitations apply and new limitations derived from the nature of the medium also apply. My best guess is that the university administration is coming from the following point of view: Although legislation is not complete in this area and will vary from jurisdiction to jurisdiction, it seems generally reasonable to hold that an institution is responsible for the contents of its web server (exceptions may apply to Internet Service Providers, though the precendents seem to be going the other way). An institutional website thus has more in common with an institutional newsletter or publication than it does a podium or pulpit located on that institution's grounds. And just as the institution places restrictions on what professors may publish in its calendar or its press releases, so also it should place restrictions on what is published on its website. If the administration is taking this line of reasoning, it has a point. Limitations will be applied to what the instructor can publish on the university website. Some of these are purely common sense: a professor cannot redesign the University Home Page or write nasty things about the Math Department's programs. Others are based on image. The university may insist on a standard format for course, program or department pages. At Assiniboine, such restrictions apply across the board, and they exist not in order to stifle academic freedom, but rather, to provide a consistent look and feel and ease of navigation across the site. Obviously there is a distinction, though, to be made between institutional web pages which advertise courses, programs and departments, and individual user pages. Individual user pages may consist of personal pages, in which a professor's interests, hobbies and wives are discussed, or they may consist of course pages, containing additional content, support for, discussion about, or material related to an on-campus or distance course. There is a great tradition especially at the university level that a professor's course is his or her domain, and the tenet of academic freedom is intended especially to allow the professor great latitude in determining the content of that course (or related materials, such as research papers or other essays). And in practise, the exercise of academic freedom has extended well beyond the domain of the discipline; it is used to defend professors' rights to opine on any subject they please, whether or not they have any insight to offer. But the freedom of the exercise of one's opinions or beliefs is not tantemount to a right to the resources needed to propogate that opinion or belief (an truth which has in the past prompted the oft-quoted adage that freedom of the press belongs to those who own the presses). The existence of a university web server, or even accounts on that web server, does not convey with it automatically an unlimited right for all professors to use as much of that server in whatever way they please. Despite the decreasing cost of bandwidth and storage space, the allocation of web server space remains the allocation of a *resource*, not a right. And it is on this shoal that the academic freedom argument falters. At our institution, for example, we are faced with the issue of whether to allow staff to post non-academic information on their web pages. A number of staff have their own companies; we quite reasonably feel they should not use the college web server to advertise their wares. Many other staff have hobbies, ranging from the noble and noteworthy, such as Habitat for Humanity, to the ignoble and not worthy, examples of which I will not list here. There is an argument to be made for allowing the placement of personal information on a web server, but it is not an argument which has its basis in academic freedom, for personal information is by its very definition not academic. It is quite reasonable for an institution to argue that its institutional website ought to be used for institutional purposes only. Especially in an environment where web resources are limited, it would be reasonable and rational for an administration to require that, if staff wish to publish personal or commercial websites, that they purchase their own account from an ISP or use a free service such as Geocities. Insofar as academic freedom is concerned, it would be reasonable to maintain that academic freedom is sufficiently respected provided that staff are *not* terminated or otherwise penalized on the basis of their personal or commercial web pages. Respecting someone's freedom to write does not entail providing pen and paper, it entails only allowing that person to put that pen and paper to whatever use is desired. 1. In cases where the same course is taught by several professors, information regarding that course in general will have to be approved, at minimum, by all instructors teaching that course, and more likely, by any body (such as an academic council) responsible for the approval of course offerings and course descriptions in general. 2. In cases where a single course is offered by a single professor, but where development is the result of a team of designers and engineers, the professor is *not* automatically the one in charge, and the content of that course would them have to be approved to some degree by all members of the team. Further to this point, it is reasonable to expect that some institutions may require that *all* courses offered or supported online be developed by a team or designers. 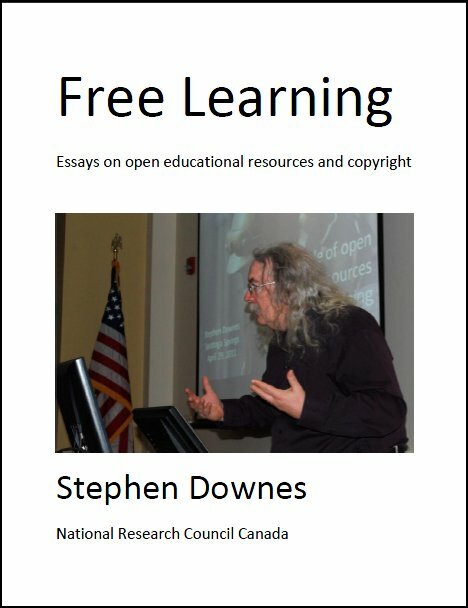 Just as we do not expect 9or want) professors to build their own classroms, so also, and for similar reasons, we may not want professors to build their own online courses. And just as professors generally have little say about the colour of the paint on the wall, or the distance from the classroom to the cafeteria, so also they may have little say about aspects of online courses. 3. In cases where individual courses are designed by individual professors, limitations may be placed on the number of pages, size of files, directory structure employed, software employed, and the like. I can think of at least one example here at the college where an instructor wished to use Microsoft FrontPage, 1 megabyte animated images, and provide plug-ins for download on the course site. Such design was incompatible with our website and would drain our delivery capacities. Fair and reasonable limitations may be placed on the design of web based courses based on compatibility, resource usage, or even good taste (which is why we deleted the pink-on-yellow illustrations). 4. In cases where one course is designed by one professor, but where this professor is designing the course as part of his/her academic workload, the resulting course may in fact be the property of the academic institution. It certainly is at Assiniboine. In such cases, if the issue of academic freedom arises at all, it is the institution's academic freedom which is to be defended. Or to put the point another way (and rather more clearly), if the institution is paying for a course, it ought to have the right to determine the course content. These four points are a sampling of the restructions which may be placed on a professor's usage of an institutional website. No doubt others could be enumerated. They are placed alongside the more familiar prohibitions against posting hate propaganda or pirated warez on personal home pages. And none of them is affected to any degree by protestations of academic freedom. Because all are cases where one person's freedom begins to brush against others' freedoms, academic or otherwise. Now all of that said, lest one misinterpret my position as being in favour of controls and against free expression on institutional websites, let me suggest an approach which maximizes academic freedom and yet which maintains the controls required by administration. 1. All content on a website which would appear in an institutional publication, such as calendar information, press release or newsletter information, course or program descriptions, and the like, ought to be under the authority of and designed by publications or website staff. Individual professors ought not to be designing institutional pages. 2. (And perhaps more controversially), online courses or course support on the website ought to be depicted as publications (not that they *are* publications, that's not my point. They should only be *depicted* as publications) as hence subject to (peer) review and 'produced' by course or instructional designers. Individual professors ought not design individual courses. 3. Insofar as personal home page support is provided (and it is by no means a right), such space ought to be used for non-commercial purposes, be subject to ethical and legal constraints, and be subject to capacity restructions (eg., 5 megabytes, as at Assiniboine) and usage restructions (eg., 100 hits/day, as at Assiniboine). 4. In the institutional space generally, and in course pages particularly, provision ought to be made for the online equivalent of a 'soapbox'. This gives professors (and presumably, students) space to air their views, but in a context where the airing of their views does not create technological problems for other website users. At Assiniboine we use in-house mailing lists, in-house discussion boards, course discussion boards, chats, and notebooks. The idea of these provisions is to depict the institutional website, not as an indistinguished whole, but rather, as a multipart entity, each part of which serves its own function. In this way the organizational goals of the institution may be met, reasonable restrictions may be applied to course and personal space, and wide freedoms of expression may be enabled. Views Today: 0 Total: 244. Last Updated: Aug 26, 2018 4:05 p.m.